"Nearly all children learning to read in English and other alphabetic languages appear to pass through a series of similar phases in their word recognition development" (Spear-Swerling, 2011). These stages, earlier explained by Ehri (1991, 2004, 2005) among others, are outlined with some variation in names and characteristics by a number of reading and word study programs, one of which being the Words Their Way framework. When in the earliest phases of reading development where the "code" is heavily emphasized, it has been well-documented that students benefit from explicit instruction of early emergent literacy skills. This applies particularly to students who struggle with literacy, as research suggests that a variety of specific intervention activities and methods for teaching decoding can be effective if instruction is explicit and systematic (Beck & Beck, 2013, p.29; Pressley, 2006, p.114; Hayes & Flanigan, 2014, p.63; Bear et. al., 2012, p.59). Moreover, "for children who are unresponsive to core general education reading instruction or initial interventions, increases in explicitness and intensity of instruction, as opposed to changes in overall instructional method, appear to be most important" (Spear-Swerling, 2011). There is additional evidence that even older students with literacy struggles benefit through explicit instruction in text structure, for example, when attempting to build comprehension of expository texts (Williams & Pao, 2011). Spires & Stone, 1989; after Pearson & Gallagher 1983. "...modeled, shared, and collaborative approaches, which tend to involve more direct and explicit instruction, are the most effective and at the same time the most culturally responsive approaches to biliteracy development for Spanish/English emerging bilingual children..."
With emergent bilingual students in mind, I began to wonder about the implications of this research for educators using a biliteracy program. If explicit and systematic instruction is so important for the English literacy development of monolingual children, it seems to follow that this would be truer still for an ELL student. 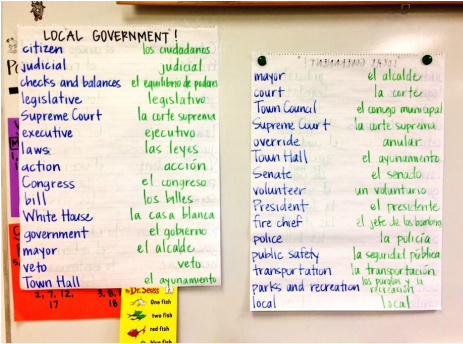 This led me to wonder about the best practices for Spanish literacy development, as outlined by native Spanish speakers, educators and researchers. 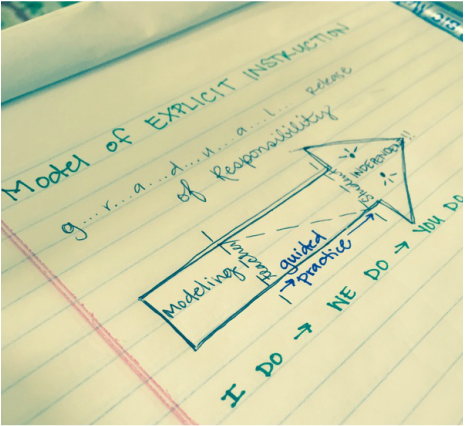 Researchers of the current student population in dual language programs like ours have emphasized explicit and collaborate approaches to instruction as well. Escamilla et. al's work, referred to as the Literacy Squared Framework, and work of others, led them "to conclude that modeled, shared, and collaborative approaches, which tend to involve more direct and explicit instruction, are the most effective and at the same time the most culturally responsive approaches to biliteracy development for Spanish/English emerging bilingual children" (2014). Similarly, the "bridge" lessons conceived by Beeman as part of her Biliteracy Framework are intended to help students make connections between languages as many "need explicit instruction in the transfer of language and concepts" (2012). Both Escamilla et. al. 's and Beeman's frameworks were developed specifically for contexts in which children are becoming biliterate, and recommend paired literacy instruction in Spanish and English beginning in kindergarten or even earlier. They assume that children can learn to read and write in two languages at the same time successfully, and provide strategies (many that mirror the explicit teaching strategies for English literacy learning such as systematic phonological awareness lessons and instruction on text structure) for assisting children in the development of two languages in ways the directly and explicitly connect Spanish and English within and across grade levels (Escamilla et. al., 2014). Beck, I.L. & Beck, M.E. (2013). Making Sense of Phonics: The Hows and Whys (2nd Ed.). New York: Guilford. Ehri, L.C. (1991). Learning to read and spell words. In L. Rieben & C.A. Perfetti (Eds. ), Learning to read: Basic research and its implications (p.57-73). Mahwah, NJ: Erlbaum. Ehri, L.C. (2004). Teaching phonemic awareness and phonics: An explanation of the National Reading Panel meta-analyses. In P. McCardle & V. Chhabra (Eds. ), The voice of evidence in reading research (p.153-186). Baltimore: Brookes. Ehri, L.C. (2005). Learning to read words: Theory, findings, and issues. Scientific studies of reading, 9,167-188. Hayes, L. & Flanigan, K. (2014). Developing Word Recognition. New York: Guilford. Pressley, M. (2006). Reading Instruction that Works: The Case for Balanced Teaching (3rd Ed.). New York: Guilford. Spear-Swerling, L. (2011). Phases in Reading Words and Phonics Interventions. In O'Connor, R.E., Vadasy, P.F. (Eds). Handbook of Reading Interventions (p.63-80). New York: Guilford. Williams, J.P., Pao, L.S. (2011). Teaching Narrative and Expository Text Structure to Improve Comprehension. In O'Connor, R.E., Vadasy, P.F. (Eds). Handbook of Reading Interventions (p.254-278). New York: Guilford. Right: Explicit Instruction [photograph]. Retrieved March 17, 2015 from http://imgkid.com/direct-instruction.shtml. 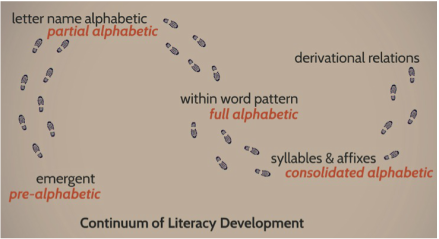 Middle: Continuum of LIteracy Development [photograph]. Retrieved March 16, 2015 from https://prezi.com/g-fwiywrran5/continuum-of-literacy-development/. Left: Stewart, A. (2014, October 6). The Bridge [photograph]. Retrieved March 15, 2015 from https://twitter.com/allisunrae/media.